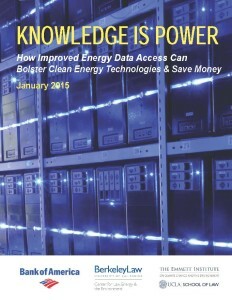 UC Berkeley and UCLA Schools of Law will be hosting a free legislative lunch briefing next Tuesday on expanding access in California to clean energy data, the subject of the Knowledge is Power report that the law schools released last month. The energy data could include improved customer access to long-term usage patterns, utility statistics on distribution grid needs and pricing, and anonymized, aggregated energy usage patterns on a neighborhood scale. The goal is to help boost California’s clean technology industries and reduce costs for ratepayers, while ensuring that the state can more cost-effectively meet its climate and energy goals. RSVP by Friday, February 20th at this link. Space is limited to the first 40 people who register, due to the size of the room. This event is presented by the UC Berkeley and UCLA Schools of Law Climate Change and Business Research Initiative to develop policies that help businesses prosper in an era of climate change. Funding for this initiative is provided by Bank of America.